Soldiers Rd Avenue of Honour - Friends of Freshwater Inc.
After World War 1 (1914-1918) our Nation was still grieving the loss of so many young men (60,000), many of whom were without a grave site to visit as their remains were left in faraway European battlefields. In the parks and streets of country towns, villages and suburbs across Australia, communities planted rows of trees commonly called “Avenues of Honour” as living memorials to those who did not return. This helped families to mourn their loss. “Manly-Warringah had at least four Avenues of Honour planted between 1922 and 1933: at Soldier’s Avenue, Harbord(Freshwater), (circa 1922); Condamine Street, Balgowlah (1925-26); Pittwater Road, Collaroy (circa 1925-26); and the School of Artillery, North Head (1933)”. “The first avenue was planted around 1922 in Soldier’s Avenue, Harbord, following its renaming from Matheson Street by community request. Local historian Gwen Gordon records that the first tree on the corner of Soldier’s Avenue and Oliver Street was planted in memory of fallen servicemen from Freshwater Surf life Saving Club (11). The local Oddfellows’ Lodge and Harbord citizens planted another, “Our Heroes Tree”, near the site of the first local Anzac Day service on a vacant lot in Soldier’s Avenue. Further trees were planted each side of Soldiers Avenue, between Oliver Street and Albert Street. Each tree guard carried a plaque with the name of a fallen soldier”. “For many years, wreaths and flowers were placed at the foot of the trees on Anzac Day. In 1985, remaining tree guards and plaques were removed by Warringah Council. Replacement plaques are set now in the Wall of Remembrance provided by Harbord Diggers Memorial Club in conjunction with Council in Jacka Park”. – Manly Library Local Studies. 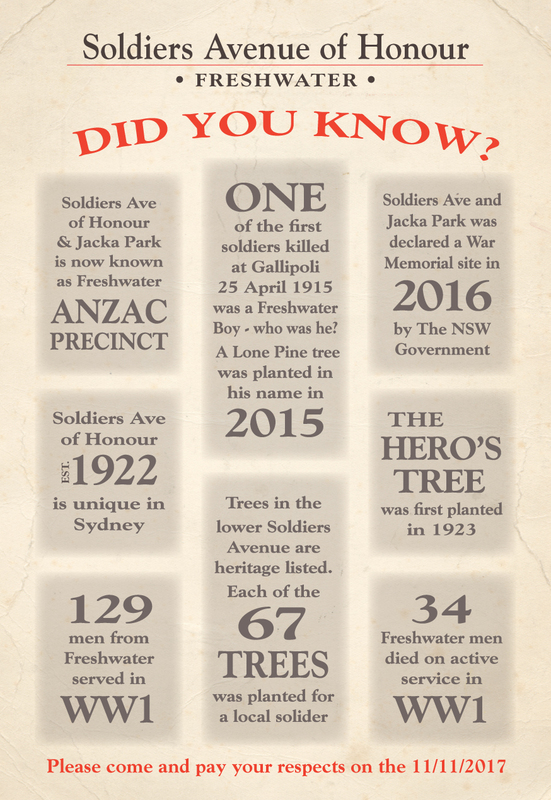 At the Centenary of ANZAC in 2015, 66 trees in Freshwater’s “Soldiers Avenue of Honour” remain and are now heritage listed. As part of a restoration project, the surrounds of a number of trees of historical significance have been refurbished. This has been undertaken by a collaboration of community groups including some of the original groups who planted the first trees from 1922 onwards. These groups including the, Harbord Literary Institute, Freshwater Surf Life Saving Club, Harbord Public School, the Freshwater Branch of Oddfellows Lodge (Now the Independent Order of Odd Fellows (IOOF)) and Warringah Council (These institutions were all in existence in 1922). Later other organizations such as Harbord RSL Sub-Branch, and the Harbord Diggers Club became involved. In 1985 Harbord Diggers Club generously funded the establishment of the Jacka Park Memorial in Wyndora Avenue, Freshwater. The Friends of Freshwater Inc., (Est.2010) saw the need to revive the importance of Freshwater’s Avenue of Honour as part of the Centenary of Anzac, and brought these groups together into the “Soldiers Ave Stakeholders Group”, along with the residents of Soldiers Avenue, to reinstate this street-scape as one of the last remaining “Avenues of Honour” in greater Sydney. The “Soldiers Avenue Stakeholders Group” with support from Local, State and Federal Governments, as well as the Harbord Diggers Club, is helping to refurbish and reinstall the plinths and plaques of a number of the heritage listed trees and to develop a unique catalogue of family histories of those who served in the great war of 1914 – 1918. These histories will be placed on the Harbord RSL Sub – Branch website ongoing from 2016 for future reference and research. Historic Ave Of Honour WW1 Council Sign 2015. In 1923 Warringah Council supported by the then Mayor and all Councillors changed the name of Matheson St to Soldiers Ave and was dedicated as a “Ave of Honour” under the national scheme in recognition of the supreme sacrifice of the men from the then hamlet of Freshwater and surrounds who marched off to the World War 1914 – 1918. Helping to save our lifestyle that we all enjoy here on the Northern Beaches – Council also changed the name of the now “Eric” Street (off Soliders Ave) to honour Eric Holloway. A re-enactment of the Soldiers Avenue of Honour Commemoration Service was held in Jacka Park and Soldiers Avenue on Saturday 18th April 2015, ninety years after the above photo was taken. On this day the Mayor of Warringah Cllr Michael Regan dedicated a newly planted tree called the “Service Tree” with the Hon Mike Baird MP Premier of NSW unveiling the newly installed Soldiers Ave “Gateway Plinth” designed by the stakeholders group with over 500 locals attending.